HA note: The following is reprinted with permission from Libby Anne’s blog Love Joy Feminism. It was originally published on Patheos on May 11, 2016. Yesterday I found out that a Catholic priest who was accused of sexually abusing a 16-year-old girl decades ago has been made director of a teen pregnancy center. This made me think about all of the ways abusers within the church gain renewed access to positions of power (I’m sure it happens outside of the church as well, but this is the area I’m most familiar with). Curious, I looked up Bill Gothard to double check precisely what he’s doing today. 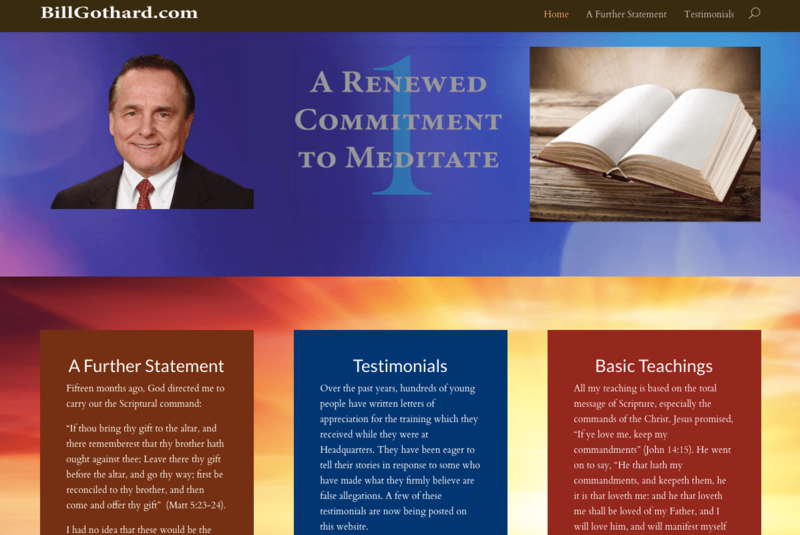 I arrived at www.billgothard.com. The website is written in first person, presumably by Gothard himself. June 28, 2015 will go down as a turning point in my life. I was awakened in the middle of the night with a strong desire to study the true meaning of genuine love. The more I studied it in Scriptures, the more aware and convicted I became of how deeply I had offended many people by my lack of genuine love. For those of you who may be new to the subject, Bill Gothard has been accused of sexual harassment and molestation by dozens of women who worked close to him as teens or young adults. He stepped down from the organization he founded, IBLP, two years ago, but has since started a new ministry, Life Purpose Power Teams. If you click through, you find eight testimonials, all written by women. During my tenure, I had many opportunities to work closely with Bill Gothard. During all these times I can honestly say that Bill never ever touched me in an inappropriate way. There was never a time when Mr. Gothard allowed us to be alone. He always ensured at least one other person be present. Because Mr. Gothard treated me with utmost respect and professionalism, I always felt safe and free to enjoy my work and life. I know after being there with you for 2 years right next to your office, sitting by you on planes, at meals, and fixing dinner for you at night, you never did anything that was inappropriate. During my time at the Headquarters, Mr. Gothard always showed a godly behavior toward me. He was very respectful of me and everyone around me. Over the past years, hundreds of young people have written letters of appreciation for the training which they received while they were at Headquarters. They have been eager to tell their stories in response to some who have made what they firmly believe are false allegations. A few of these testimonials are now being posted on this website. This preface does not explain why the testimonials are written exclusively by women or why they all include some reference to the charges of sexual harassment and molestation levied against Gothard by dozens of women over three decades. The import of these testimonials is clear—it’s an attempt to convince supporters that Gothard is innocent of what he is accused of. This feels very, very familiar, as I’ve watched it play out in the homeschool community in which I grew up. The argument stems from a misunderstanding of how abuse operates. That an abuser did not abuse every individual they had contact with does not mean they did not abuse any person they came in contact with. In fact, abusers typically choose their victims carefully while acting in an upstanding way toward those they are not victimizing. This helps hide their abuse by ensuring that no one will believe their victim if they speak out. An individual who abused every individual they came in contact with would soon be ousted from power. It is our experience that the “grooming” a child is only half the story. Many pedophiles are extremely clever, often charming, patient people, frequently thought of as among the most valued of community members. That’s because they spend a lot of time grooming the parents, friends and neighbors of the children around them, just as they groom the kids themselves. It’s not unusual for pedophiles to pick careers and / or volunteer positions that will deliberately place them in close proximity to the youngsters they crave. They’ll then proceed to impress (or “groom”) the adults around them by becoming the most reliable on-call volunteer, the most generous friend, the most giving neighbor or the favorite relative. Their presentation makes them seem to be completely sincere, among the most trustworthy and valuable community members. Parents of molested kids will often be shocked at their own naivety, but pedophiles are as clever as can be in grooming the adults around them, too. I mentioned a few weeks ago that the community in which I grew up has been rocked by sexual abuse allegations against several members. Watching these situations play out has even me first hand experience with many of the excuses made for abusers and the tactics used to shift blame to their victims. What Gothard does in highlighting testimonials of women he didn’t abuse is right in line with these same tactics and patterns, but it requires an ignorance of how abusers operate to work. This is why raising awareness of the dynamics of abuse is so critically important. Admin Note: Loura, would you mind editing your question for clarity’s sake? It sounds like you are saying abuse happens by accident, and that you are minimizing the atrocity of abuse. this is what bothers me. it makes things sound like an abuser is just a victim too. as to your other question, i think that abusers do have an agenda. they are looking for something to satisfy their craving. the first abuse is just as real as the second and the thirtieth. how we protect our children and adult loved ones is by being aware of patterns. even a first-time abuser has a pattern that can be recognized. that’s why it is important to pay attention to the patterns of a serial abuser. they expose the patterns that abusers use. any time someone is trying to isolate us, or make us question ourselves, if they are unduly praising us, or making us feel special for secret attention, i think that our boundaries need to go up. it takes a lot to repair abuse, and a lot to maintain healthy boundaries to help protect someone. but. i don’t think that someone who does get caught by an abuser, who does not see the pattern, that they are in any way to blame for their abuse. it happens. it happens even to the most aware of us. there’s no such thing as a perfect abuse prevention tool, not with statistics the way they are. but we can be there to try to help protect. and when someone has been abused, we can be there to support, listen, believe. Admin Note: Intentions aside, in your last paragraph, you *are* making abusers out to be victims that we should be helping, so we can prevent them from becoming abusers. This is a site for supporting survivors and victims, not a site for abusers. Please edit your comments. Your comments about abusers’ motivations can be highly triggering to abuse survivors. We have not deleted them and attempted to dialogue because we know you do care about survivors. However, we cannot continue this conversation here. It is triggering and goes against our goal of a safe space for survivors. Is Got Hard’s hair a Photoshp or dye job? Or are all his official pics from 20-30 years ago? He’s supposedly 80, yet all his pics show his surviving hair as dark-to-black. I’m 60 and my originally-burnt umber hair is now about the shade of Danerys’s from Game of Thrones.